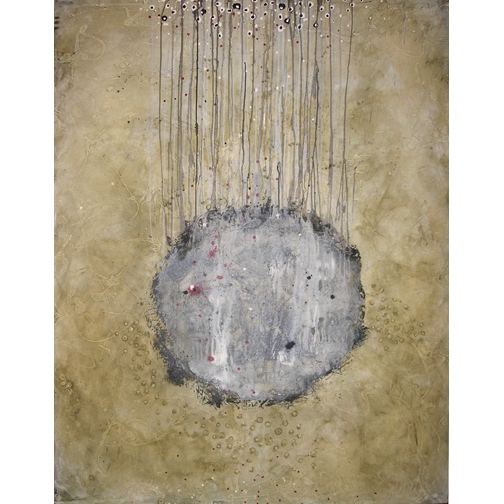 This entry was posted in Drop Dot and Red Dot Posts, Exhibition Posts, Fine Art Process and tagged drop dot, Energy Blooms, hale art space, los angeles fine artist, Notes: Karrie Ross on January 11, 2013 by Karrie. I’m putting together another show for October… and painting and drawing my trees and what shows up… but a bunch of Follow The Red Dot paitings… I’m thinking they are going to make it to the show too. For this one I took an older painting I wasn’t happy with and started fresh with the layers from the previous one showing through giving the texture I like to add in layering. I’m imagining trees on this somewhere so it’s trees and red dot… will post new image once finished. This entry was posted in Drop Dot and Red Dot Posts, Fine Art Process and tagged Fine Art Process, follow the red dot, los angeles fine artist, Notes: Karrie Ross on September 4, 2012 by Karrie. Excited to say that one of the bustiers have also been added to the Blicher/Golightly Santa Monica; Test Pilots II Show May 23rd thru June 14th. at 1431 Ocean Ave, Santa Monica Ca. Between Broadway and Arizona. Opening Saturday May 26, 8-10 pm. For more information see the previous post about the Energy Blooms piece. 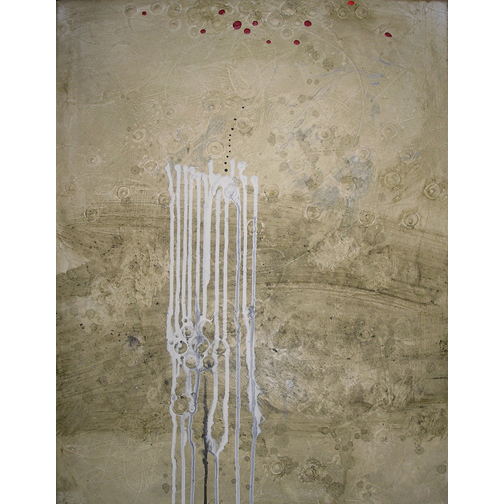 This entry was posted in Drop Dot and Red Dot Posts, Exhibition Posts, Notes: Karrie Ross and tagged Blicher gallery in Santa Monica, fine art, los angeles fine artist, Notes: Karrie Ross on May 25, 2012 by Karrie. A play on words and visual. I am forever following the red dot, in the flash of a camera or the sale of a piece of artwork, a red dot seems elusive and at times unreal. My compelling Follow the Red Dot series addresses the more abstract of the concept and actually gives you real red dots to follow on the artwork. This work does not embrace the inevitable or reference repetiveness or labor through mediums or refracts or confines. It explores your desires and dreams of… Sometimes falling and other times just sitting there daring you to look…closer …at the texture that surrounds IT (the red dot)…its universe…its life. The struggles and joys of line, drips, drops and dots reminding us we are all in this together. There is no elusiveness just what is and what is IS to follow the red dot wherever it leads…hope is around the corner and to continue. Follow the Red Dot: "Drifting"; 16x20; oil, acrylic; ink on canvas. ©2012 all rights reserved. All art is for sale. 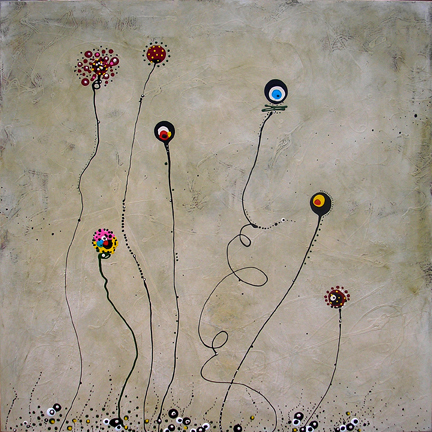 Follow the Red Dot: "I will never forget you"; 16x20; oil, acrylic; ink on canvas. ©2012 all rights reserved. All art is for sale. 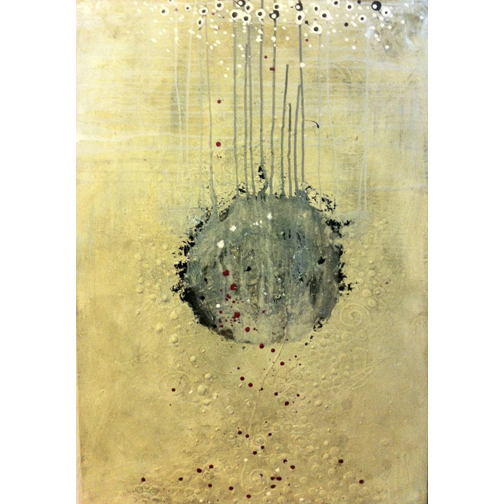 Follow the Red Dot; "Bubble Bubble"; 36x24; oil, acrylic; ink on canvas. ©2012 all rights reserved. Follow the Red Dot; "The Gathering"; 60x48; oil, acrylic; ink on canvas. ©2012 all rights reserved. SOLD: "Do You Feel Me? "; 36 x 24; oil, acrylic; ink on canvas. ©2012 all rights reserved. Organic in nature, working with oil and mixing it with acrylic and pencil brings about the most raw of imagery and textures layer over layer of seemingly undone beginnings to the final …. Red Dot. Buy my Art! I’m a Feng Shui practitioner and hands on healer. Both are about connecting with energy and vibrations. Red is a very powerful color, it’s hot. Red is a motivator. Red vibrates at a high rate. When you vibrate red it begins to break up and disperse…healing and moving. 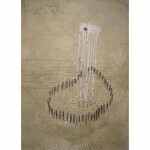 The Exploring the Red Dot paintings bring the Red Dot to you. To your vision and vibration. 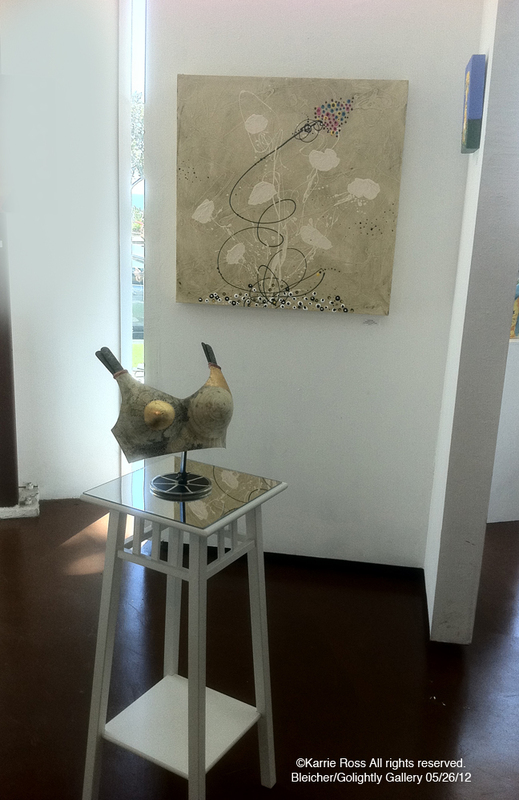 The intention into the paintings is sharing the experience and what is found in my exploration. So as you view and become involved… somewhere inside you will vibrate in the connection… and be healed and/or moved. AND ,my intention is successfully shared. When I meditate sometimes I see a red dot surrounded by purple or greeen yellow or blues. Over the past 30+ years I’ve been searching for healing. It began with wanting to heal my body from the accidents that happened and expanded into the healing and expansion of intellect and emotions. What I found was a connection with the energy of the universe…and the vibration. Once I connected I realized I’d found home where within and without became one in the purest of energy. I am never alone. I play lots. And love to share the fun. 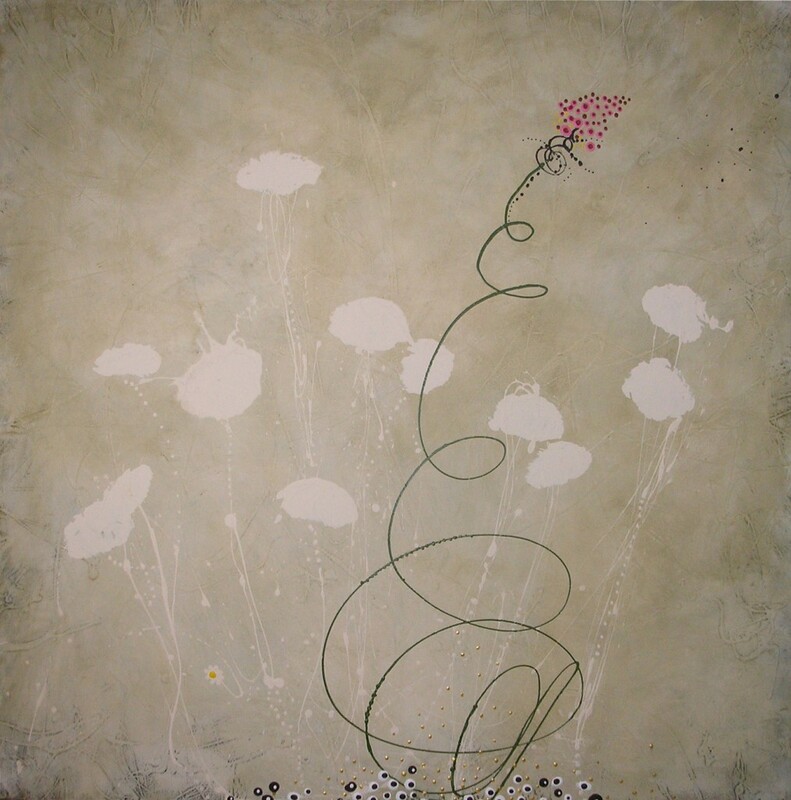 Karrie Ross is a Los Angeles Fine Artist who writes about the fine art business and process. She is available for educational panel discussions on her fine art and process. 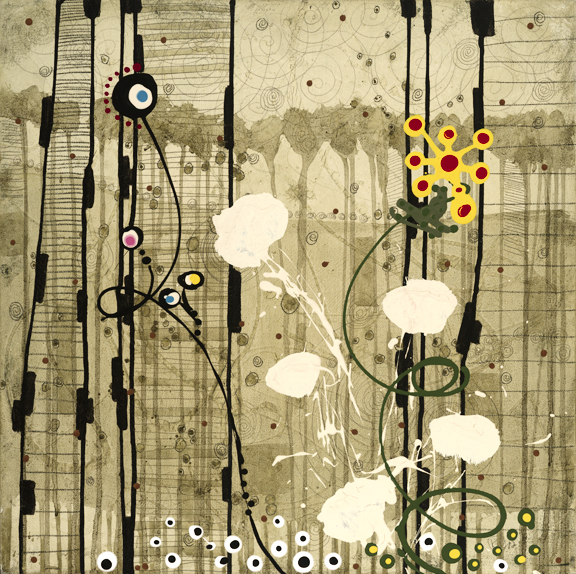 Her artwork is available for solo or group show, installations and public art opportunities. Please contact her at email for more information. 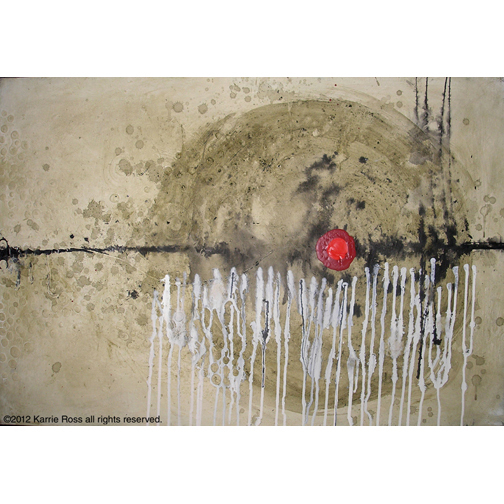 This entry was posted in Art For Sale!, Drop Dot and Red Dot Posts, Fine Art Process, Notes: Karrie Ross and tagged energy painting, Exploring the Red Dot, follow the red dot, los angeles fine artist, Notes: Karrie Ross, paintings have vibration on March 23, 2012 by Karrie. 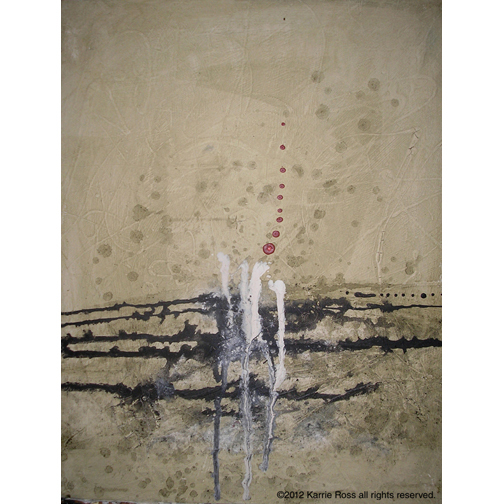 This entry was posted in Drop Dot and Red Dot Posts, Fine Art Process, Notes: Karrie Ross and tagged abstract fine art, Energy Blooms, los angeles fine artist, Notes: Karrie Ross on March 2, 2012 by Karrie.